Mala of small sized five mukhi beads in pure silver with cone shaped silver caps. Five mukhi rudraksha is ruled by planet of lessons- Jupiter. Gives wisdom, learning and knowledge. 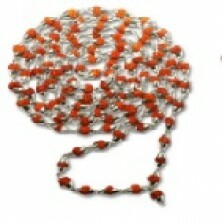 This is popular among devotees of Lord Shiva and commonly worn for health, worship and peace of mind.